CARLSBAD CAVERNS NEW MEXICO ROADRUNNER AND CACTUS SOUVENIR SALT AND PEPPER SHAKERS. 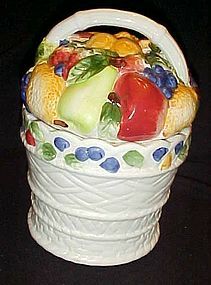 Made by Treasure Craft California pottery. Marked in mold and has the original rubber stoppers. Excellent condition with no damages. Cactus is 4" TALL, roadrunner is 4 3/4 " long. 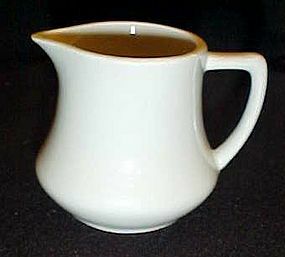 Inter American White Porcelain Creamer. 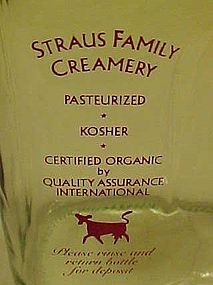 Small individual creamers made in Poland by Inter American. Stamped on the bottom with the makers L logo and 1.3.9.. Excellent condition. It measure 2 1/2" tall 3" wide including spout and handle. 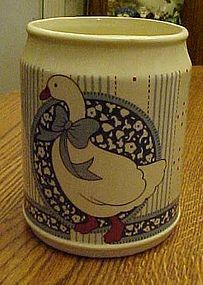 Nice ceramic cookie jar with hand painted decoration. Basket of mixed fruits, apples, oranges, grapes, ect. Measures 10" tall. Average condition with a couple of chips on the inner rim. 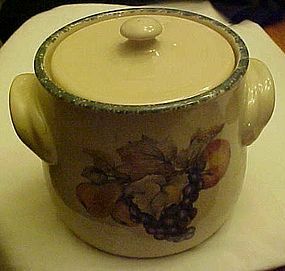 Made by Alco Industries Inc China marked on the bottom. Made of hand painted ceramic. 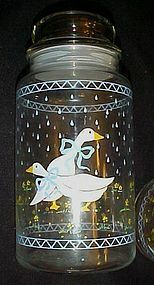 B&D, JAPAN Ribbon/geese pattern, Blue calico medallion background with white duck or goose with orange feet & bill and blue bow ribbon, background also has blue vertical stripes & orange dots. This utensil holder measures 5 3/4" tall, and is in excellent condition with no chips, cracks, or crazing. Little to no signs of usage. Design vivid & intact with little to no wear. Bright & glossy. 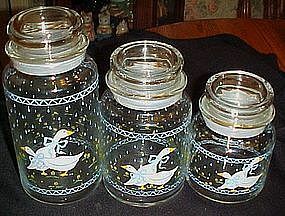 I have a few other items in this pattern listed in my catalog. 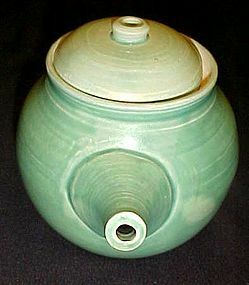 Handmade pottery teapot with a very interesting spout. Green rings look,matte glaze effect. No chips or cracks. Signed Diedre on the bottom so I do not have any idea how old or new it is. Wonderful condition and cute! Measures 4 1/2" tall plus the lid. Souvenir salt and pepper shakers from Santa Cruz California. 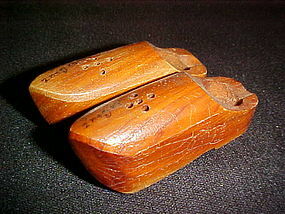 Varnished redwood dutch clogs. Measures 3" long. Stoppers are missing Would still be a nice addition to a shoe collection. 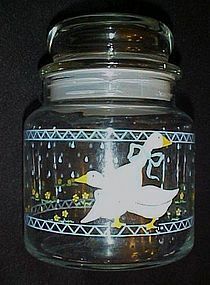 Anchor Hocking Farm Country geese glass cannister 5.50"
Anchor Hocking farm country geese glass cannister 7"
Anchor Hocking Farm Country Geese glass cannister 8.25"
Plastic Cow Salt & Pepper Shakers Black And White. No chips, no cracks. Stoppers intact. 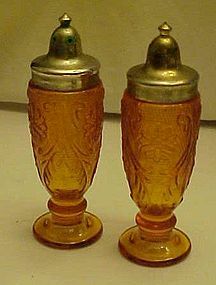 Measures 2" high and 2 1/2" long. Nicely made. 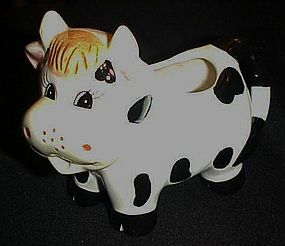 Collectable Houston Harvest ceramic black and white Cow Creamer. with a pink udder. The creamer is in excellent condition. 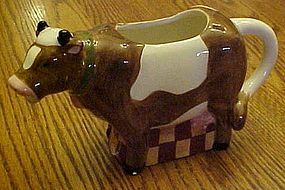 The Houston Harvest Cow Creamer has no cracks or chips. With this cute face this item is a must for any cow collector. Measurements 4 1/4" tall 6" long. A pair of vintage Fenton hobnail milk glass salt and pepper shakers. The glass is in very good condition with no chips or cracks. The lid has some flaking to the chrome plating on one, but no corrosion. Each shaker measures 3.25 inches tall x 1.5 inches diameter. Adorable "Susan Winget Cow Creamer made in China, by Certified Intl Corporation" from the Homestead line. It measures approx 7 1/2 from spout to end of handle, 3 3/4" in height. The creamer is in great condition no chips or cracks. 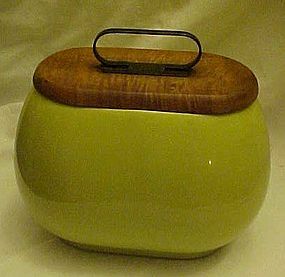 Old glazed pottery cannister or maybe a cookie jar with original hard maple lid with metal handle. Looks like it's from the 40's-50's. Perfect condition but no markings. Excellent condition. Measures 5 1/2" tall plus the lid. Oval shape is approx. 5" x 9". Simple and functional. I just don't know the maker.